Despite a positive recent meeting, the road to a code for the troubled region is likely to be a long one. A series of high-level ASEAN meetings culminated in Suzhou, China on September 15, when senior officials from the forum for the first time met to formally discuss the possibility of a code of conduct (COC) in the South China Sea. According to the Chinese Ministry of Foreign Affairs, the meeting ended positively, with an agreement to seek “gradual progress and consensus through consultations,” though no deadlines or details about the joint working group that will carry out the task were made available. It is likely that the development is an attempt by Beijing to woo ASEAN once again, given the skepticism among member countries towards China in recent years. Most media reports from ASEAN countries reflect the national disbelief that China is indeed keen on creating a COC in a timely manner. Singapore-based Channel News Asia, for example, reported on the meeting under the headline "Beijing open to code of conduct in South China Sea, but not now," suggesting that China still seemed more comfortable bringing up the issue bilaterally than in multinational forums. 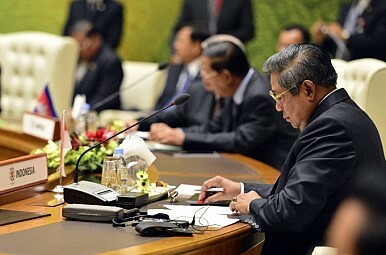 The sole exception was the Thai media, which claimed that the ball had been set rolling for a speedy resolution and quickly suggested that as the coordinator of China-ASEAN relations, Thailand is the only nation poised to act as a “tough broker” – more so because of its non-claimant nature in the dispute. Even the Chinese state-owned media – the People’s Daily – bracketed the COC issue with past violations of the 2002 Declaration on the Conduct of Parties in the South China Sea (DOC), suggesting that a new, binding code would be meaningless if earlier agreements were not upheld. It seems China might have agreed in principle to a COC, but it is not ready to make the adjustments necessary to draw up a functioning document. It has successfully managed to coerce and arm-twist its neighbors in the region by virtue of its vastly larger size and stronger military, seen as recently in March 2013 when it held amphibious landing exercises to “defend the South China Sea” near the Spratly Islands, barely 50 miles off the coast of Malaysia. Its claim to most of the South China Sea through the nine-dashed line, which seems to have been expanded to a ten-dash-line in the latest maps, is also unlikely to stand scrutiny if a COC came into force. For China, therefore, Xi Jinping’s July exhortation to a Politburo study session suggesting that resolving maritime territorial disputes did not mean abandoning "core national interests" still holds paramount. Yet it is not just China that wants to go slow on the COC. If a code of conduct is finalized, all major claimants in the region will either have to justify or retract from projects of strategic and economic interest to them including, but not limited to, the U.S. rebalance to Asia. Vietnam’s offshore exploration projects with countries like Russia and India, for example, while within its EEZ, have faced constant objections from China that has claimed these areas as its own. It is unlikely that China will allow the COC to proceed as long as these projects continue. The COC may also affect the budding U.S.-Vietnam military cooperation as well as other military relationships like the recent Indian $100-million credit line to Vietnam for patrol boats for the same disputed waters. Similarly, the Philippines, which is set to welcome back U.S. Navy vessels after two decades and is expecting its first visit from U.S. President Barack Obama next month, is unlikely to agree to give up its recent diplomatic gains. Singapore too, has enjoyed long security ties with the U.S. which are slated for an upgrade with plans to berth American littoral combat ships there as part of the rebalance. Malaysia’s recent claim that it is less worried than other claimants are about Chinese patrol boats in the disputed waters shows that the constituents of ASEAN are not as united on keeping China in check as previously believed. It is also unclear how proceedings at the UN Arbitral Tribunal in the Hague, which the Philippines has approached, will affect the COC. Given the current political dynamics of Southeast Asia, it is unlikely that any country labors under the belief that the South China Sea issue can be resolved with a code of conduct. For most it is another way of keeping China in check. The road to the COC, therefore, is likely to be a circuitous one, balancing China’s great power aspirations on the one hand, and the interests of smaller countries in accruing economic and security benefits from the region on the other. Deep Pal is a Research Intern at Freeman Chair in China Studies at CSIS and a master's candidate at The George Washington University. You can follow him on Twitter @DeepPal1980.